Papa’s New Home is the award-winning story of a young girl who loses her grandfather, Papa, only to get to see him again in a miraculous visit to his new home, heaven. Here are a few of my favorite things about this book. I like that the book not only mentions Jessie’s sadness and confusion about Papa’s death, but also her anger. I think that anger is an often overlooked stage of grief in regards to young children. While anger is only mentioned in one or two sentences I think that it’s enough to open up communication with a child who is experiencing anger in grief. I like how Papa explains that bodies can get old, or sick, or hurt and stop working, but that our spirits never die. I really like that Papa is portrayed as still looking the same age as when he passed. Many hold the belief that everyone in heaven is young, but I think that concept can be confusing for young kids. This book obviously contains spiritual elements with mentions of heaven, spirits, and angels. However, this is not a specifically Christian book as there is no mention of God or Jesus. This book would appeal to families of many different faiths. It paints a very vivid picture of Heaven beyond what is mentioned in Scripture depicting lost loved ones with jobs they enjoyed on earth (such as gardening) and living in houses with beloved pets and eating chocolate cake with relatives. The story is beautiful and the lovely illustrations definitely help portray a feeling of peace. 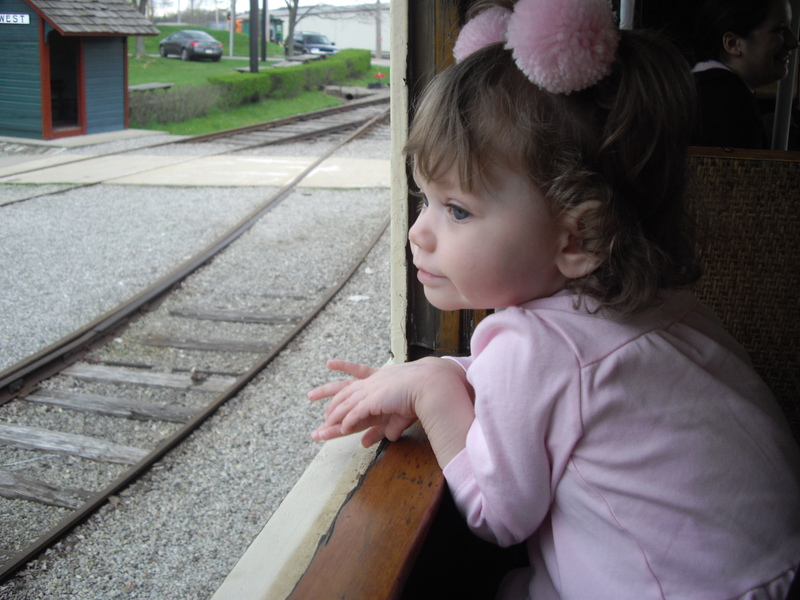 For the right child it could be a powerful tool to help with the loss of a grandparent. If you’re in the Pittsburgh area you can meet the author of Papa’s New Home, Jessica Lynn Curtis, at a book reading and signing this Saturday! copies of her Mom’s Choice, award winning title, PAPA’S NEW HOME! Buy Papa’s New Home on Amazon! You can also like the book on Facebook and follow Jessica on Twitter (@JessieLynn817! *Disclosure: This post contains Amazon Affiliate links. If you purchase through one of these links I may receive a small amount of money. I was not compensated for this review, all opinions are my own. My family was invited to visit the VIP Grand Opening of Fun Slides Carpet Skatepark in Pittsburgh last Friday and we had so much fun! The new facility is located at Pines Plaza Shopping Center on Perry HWY behind Shop N Save. The 33,000 square foot black light facility, located in the space under the Shop N Save in Pines Plaza Shopping Center is divided in sections based on skill level and every new skater, regardless of age or ability, is assigned an instructor for basic lessons. With ramps ranging in height from six foot tall down to short beginner ramps just about anyone can learn and have fun. The COOLEST Birthday Party and Family Fun Spots! 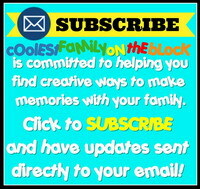 Whether you’re celebrating a birthday, looking for a unique group outing or just dropping in for some public skate time, you’re sure to experience wholesome family fun like you’ve never had before! *Birthday party packages for ages 4-7 and 8-teen. Fun Slides, a multi-award-winning product from Simtec, Co., are plastic sliders that attach under athletic shoes. They provide the sensation of sliding on a hardwood floor with socks on. At Fun Slides Carpet Skatepark and Party Centers, kids and adults slide on the skatepark’s carpeted ramps, jumps and slide rails for an easy to learn thrill. Athletic shoes must be worn in the park at all times! No FLIP FLOPS! Everyone who skates at Fun Slides Park, must have a signed waiver. *Anyone under 18 must have a parent or guardian sign the waiver. *18 and over may sign their own waivers given that they produce proper ID. Fun Slides Park requires that helmets be worn by children under 8. Elbow pads, knee pads and wrist guards are recommended in all areas especially for novice skaters. We brought our own helmet and elbow and knee pads for Adaline, who is 4.5 years old. We all thought that Fun Slides Carpet Skatepark was really cool. Adaline had a blast going from slide to slide and even my husband enjoyed sliding around. We’ll definitely visit again. The World’s only carpet skate parks! Do you skateboard or roller-blade? Would you ever try a carpet skatepark? Disclosure: My family received free admission to the skatepark as part of the VIP Grand Opening for bloggers and other media. I was not asked or required to blog about my experience. All opinions are my own. If you are local to Beaver County PA or the Greater Pittsburgh Area, please like my local Facebook page Beaver County Family Fun for updates on local family friendly activities. This list of farm festivals has NOT been updated for 2013. However, below you will find links to each farm’s website where they should have details about their festivals. For more local updates please check my LOCAL PAGE and FACEBOOK PAGE. Please visit the individual websites for details on each farm’s activities. Listed here are local farms hosting fall/harvest festivals, pumpkin patches, corn mazes, hayrides, and fruit picking in Western PA’s greater Pittsburgh area during October 2012. A list of fall festival and events in Beaver County, PA and beyond can be found here for 2012. Weekday afternoons enjoy a short tractor drawn hayride out to the pumpkin patch to pick your own pumpkins. Plus, pumpkin painting, straw pile, maze, and farm animals are open every weekday afternoon. Sunday, September 16th – Scavenger Hunt and Scarecrows by Scouts: Searching for clues is a tradition if you visit the farm during kick-off weekend! today we host our scouts in appreciation for their scarecrow-building talents. Saturday, September 22nd: Third time is a charm! We are hoping to weigh-in a world record this year and have a TON of fun doing it. Witnessing these orange wonders is the ideal way to spend the first day of autumn. Saturday, September 29th: Jump right in and spit some seeds, be a wheelbarrow or balance a pumpkin on your head! Guaranteed fun for all who join in. Local mascots will be sharing this day with plenty of handshakes and hugs to go around. Saturday, October 6th and Sunday October 7th: A homage to the heritage and history of our sacred ground here along French Creek. Encampments featuring storytelling, and traditional demonstrations are passionately expressed by French Creek Living History Association. MUSIC MAKERS Saturday, October 13th: Traditional musicians share their talents and add a joyful element to the energy of the farm. Lend your ears, clap your hands and feel free to dance and sing if you’d like. FARMER FOR A DAY Saturday, October 20th: Roll up your sleeves and prepare to get a li’l dirty! Farm chores are hard work, but can be quite satisfying. Be a part of our Children’s Garden by pitching in and contributing to it’s splendor. PUMPKIN-MANIA PARTY Saturday, October 27th: Near the end of the season, things get a little kooky and we see nothing but orange! This day is ALL about pumpkins and ways to use them for entertainment. Pumpkin treats and antics await you. children can pick a pumpkin and then decorate it plus much more! Reilly’s is open every weekend for a Harvest Festival of Fun! Hayrides to the great pumpkin patch where you’ll find all sizes of pumpkins for your picking pleasure, Pumpkin Patch Hayrides, the New Boo Barn with added excitement, the Cornstalk maze, Marshmallow roast, Balloon Typhoon, Pedal Go Carts, Pony Rides and Petting Zoo, Face Painting, Cow Milking, Scarecrow-Making, Country Store, Wanda’s Games, Ducky Plucky, Carmel Apples, Refreshments. A one-price a super Harvest Festival ticket includes activities. No reservations needed, just come and have fun! Currently no information available for 2012 festival. EAT: There will be a ton a great food every fall festival weekend including Amish donuts every Saturday for $1 each (cash only Amish donuts). Enjoy a hayride to our pumpkin patch to pick-your-own pumpkin or see if you can find your way through our giant, 4-acre corn maze! There are fun things to do and great things to eat and drink including fresh apple cider and over 15 varieties of apples grown at Trax Farm, candy apples, heavenly pumpkin gobs and other seasonal treats from our bakery. Apple Cider and Caramel Apple Dip during fall festival only! Many of the above pumpkin patches include corn mazes, please check the descriptions. The following are corn mazes only. NEW THIS YEAR…GEM STONE MINING ATTRACTION!!! The maze this season is 20 amazing acres, 4 separate mazes in 2012, 18 checkpoints to locate! Play FSI and Farm Tracks. Gemstone Mining Attraction, Straw Pyramids, Corn Box, Corn Hole, Wood Cut-outs for Photos, Swingset, Hayrides and Barrel Train rides (Saturdays and Sundays check prices), Concessions by GandG (sausage sandwiches, steak hoagies, corn dogs, great french fries, apple dumplings, lemon shakes, ice cream, popcorn, and more! This is not a haunted maze, but you are welcome to come after dark and bring your own flashlight, or you can purchase one for $3.00 when you arrive. 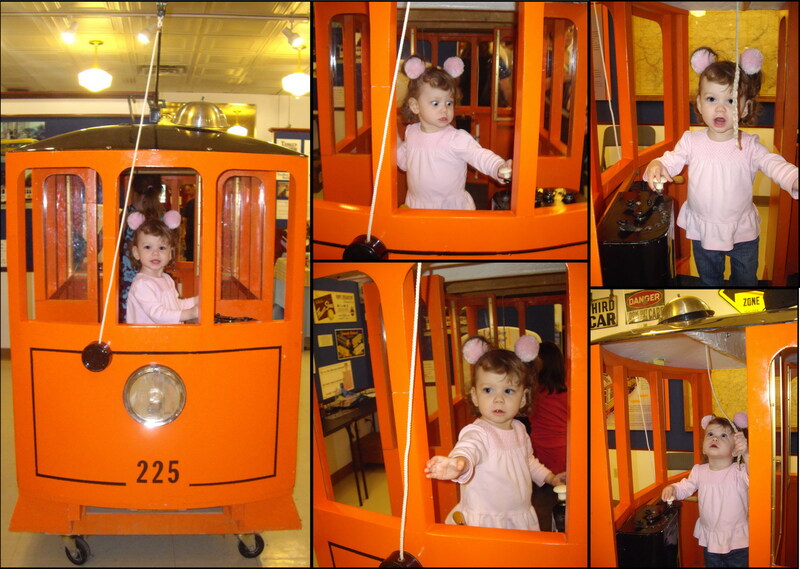 Last year we made our first trip to the Pennsylvania Trolley Museum in Washington, PA to ride the Bunny Trolley. 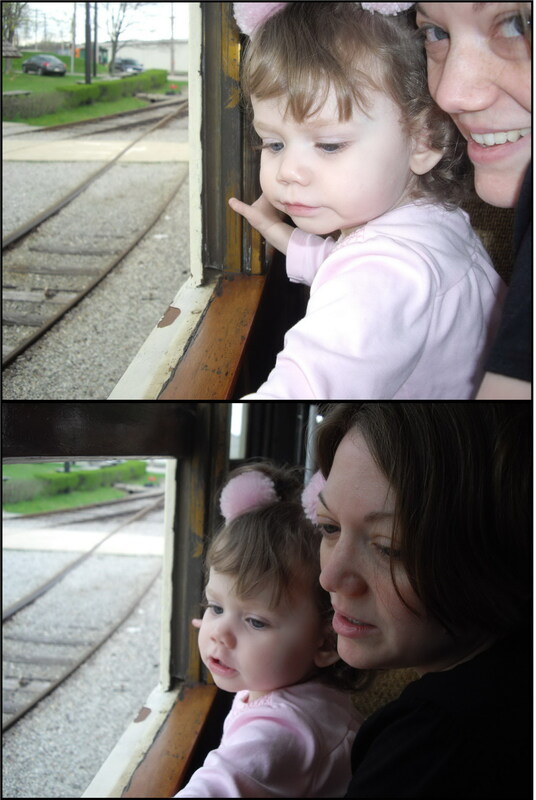 Adaline loved it and we’re planning a trip this year too. 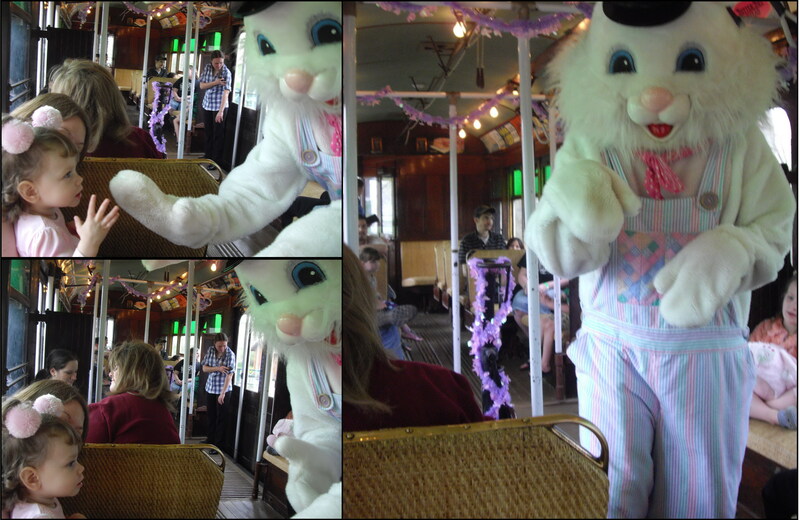 The Bunny Trolley opened yesterday. 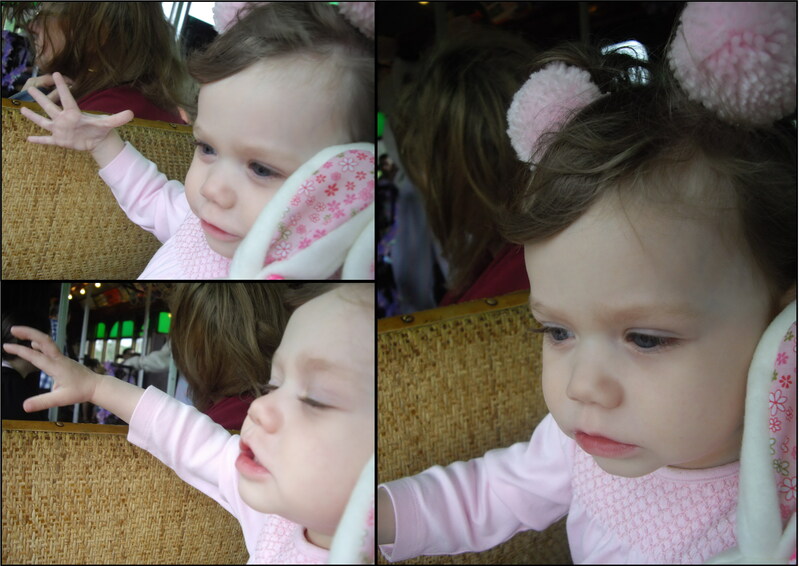 Adaline enjoyed playing on the kid-sized trolley. All aboard the Bunny Trolley! Waiting for the Easter Bunny. 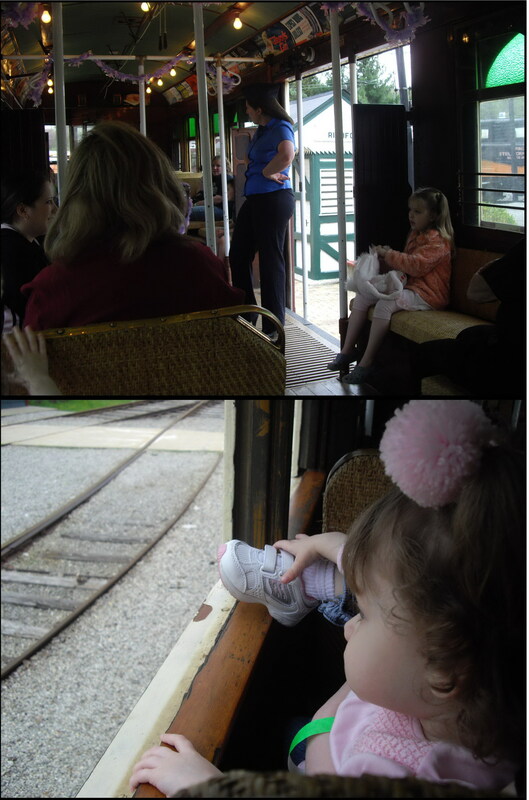 Adaline sticking her foot out of the window at the same time the lady is telling everyone to keep their arms and legs inside the trolley at all times. 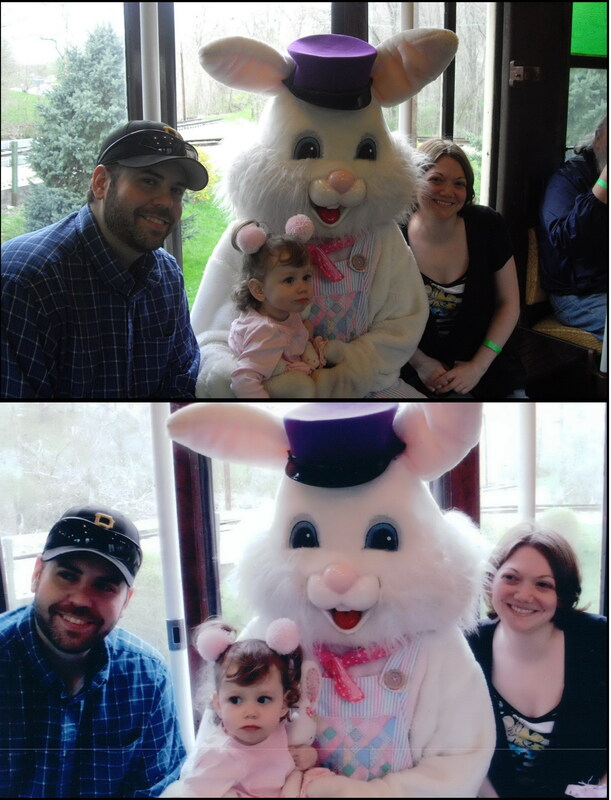 Adaline meets the Easter Bunny…handshakes and high-fives! Weeee! The trolley is moving! 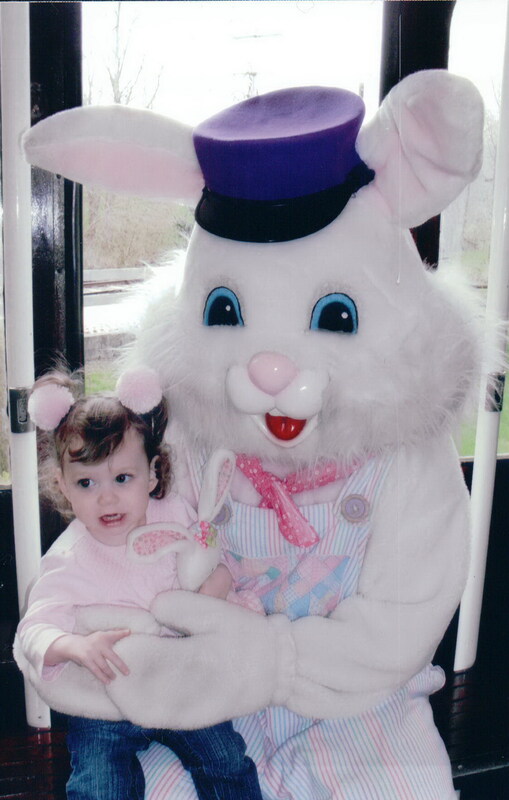 Time for photos with the Bunny. 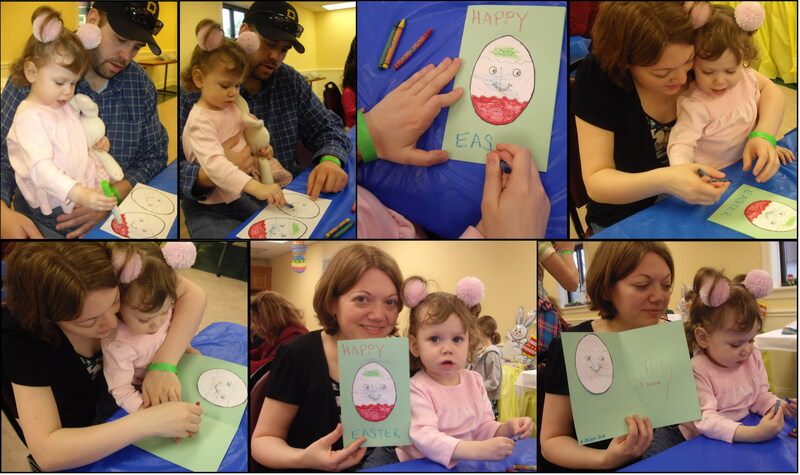 After the trolley ride we got a chance to make a keepsake Easter card. Adaline colored with crayons and markers and we traced her hand. 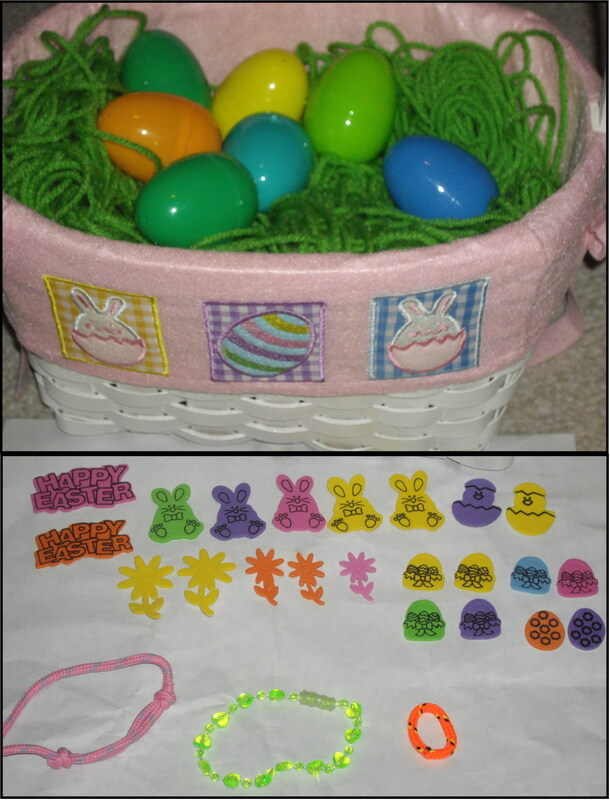 Next was the Easter Egg “Hunt”. 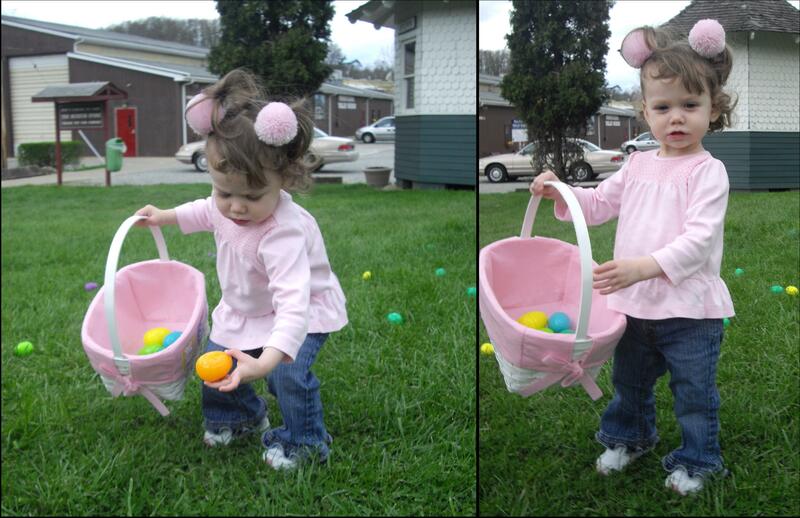 Adaline really enjoyed picking up eggs and putting them in her basket. 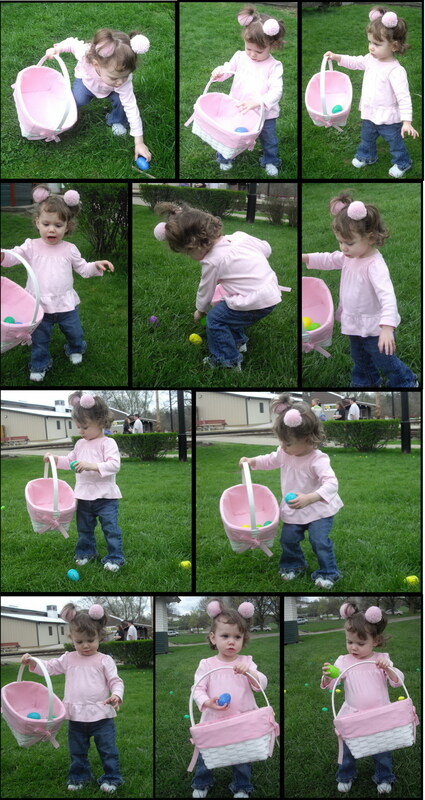 There was a limit of 7 eggs per child otherwise she would’ve been happy to collect them all! Adaline’s stash from the hunt. 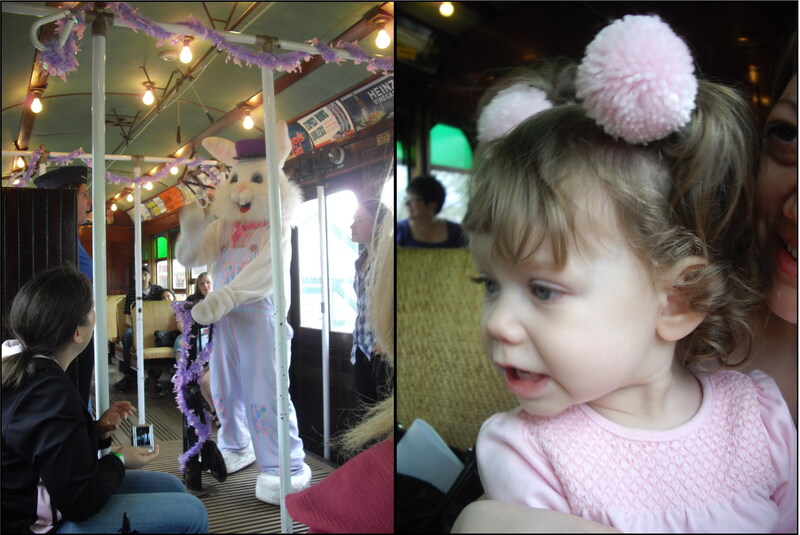 Believe it or not Adaline talked about the Bunny Trolley all year and she’s so excited to go back again this year and bring her baby brother. 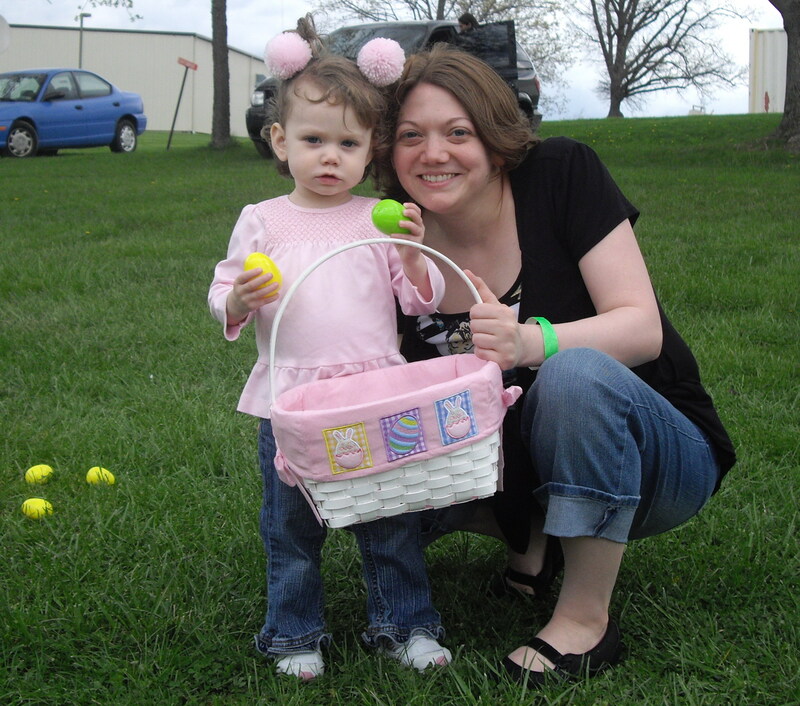 If you live locally be sure to check out my post listing local Easter Egg Hunts and other events! ATTENTION: This list was originally from March/April 2012 and has been removed. You can find the updated list for 2014 here. I’m trying to add more events as I find them. Please check the Beaver County Family Fun Facebook Page for updates. Thank you. ATTENTION: This list is from December 2011. An updated list will be published when information becomes available (November/December 2012). Please check my LOCAL: Beaver County, PA page until a new blog post has been published. Click the button below for a list of events happening October 2012. Thank you. If you’re looking for a place to have some holiday family fun in Beaver County, PA this December…you’ve come to the right place! Parades, light-up nights, visits with Santa, craft shows, model trains, and more in Western PA’s greater Pittsburgh area. Who knew there was so much to do in Beaver County?! 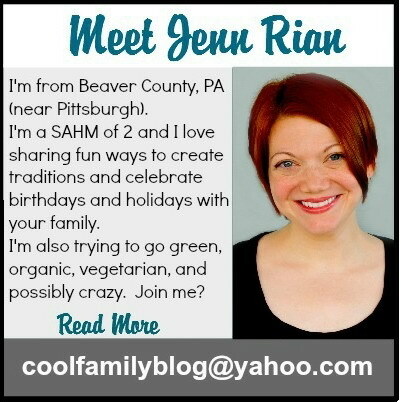 I’ve also added a few events that are happening in Western, PA but they’re outside of Beaver County. They might be worth the drive! *New events that have been added since the original post on 12/01/2011 will be in red text until the event is over. This should make it easy to scroll down the list to find new events. Bookmark this link as I’ll be adding more events to the list as information becomes available (subscribe here). ADMISSION TO Holiday mART IS FREE! Walk into a Winter Wonderland featuring the Spirit of Christmas. A wide variety of creatively designed Christmas trees displayed each with a different theme and wreaths. 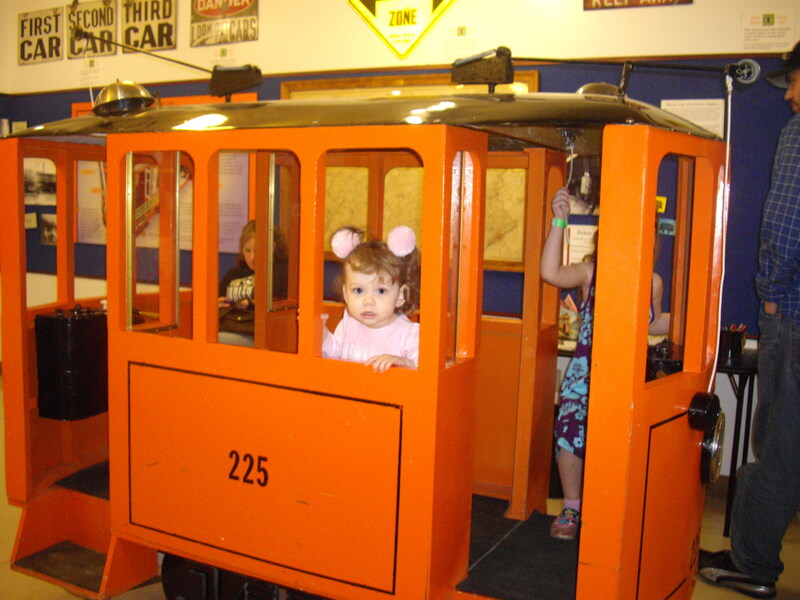 Visit the Kid’s Corner, the Candy Lane gift shop and enjoy the model train display. All proceeds benefit the Valentine Dream Fund for Kids and Search, Rescue and Recovery for Missing Children and Adults. Come celebrate the holidays at Sewickley’s annual Light Up Night. Stroll the streets of the Village while enjoying food from street vendors, free horse drawn carriage rides, and live holiday entertainment on two stages from No Bad JuJu, Dancing Queen and many local dance groups. Local stores and restaurants will be open for shopping and dining. The lighting of the village to start at 6:30pm and will be followed by a fireworks show. Free parking. Horse drawn carriage rides, train rides, an ice carver, wood carver, carolers, gourmet food sampling, wine tasting, door prizes, bonfire, kids toys & activities, visit Santa and much more! The Amish will be here making their famous donuts. Holidays present the perfect time to bring us together with loved ones, and remind us what is really important. Come visit, step back away from your hectic surroundings, and experience Christmas in the Country at Reilly’s. You’ll find special memories that will last a lifetime. A cheery bonfire to warm you as you choose the perfect tree, Marshmallow roasting to bring extra sweetness to the season, A live animal Nativity Scene to delight the younger generations who can visit and feed the animals, Light lunches – our own farm made chili will be served in the Tropical Café, Hot Chocolate, cider, and coffee to add a bit of Christmas spirit. Hayrides with Santa. Take a complimentary wagon ride with Santa over the hills and around the farm. Click the above link to read about Santa’s List, a must-do if you plan on visiting Santa! We will have food, face painting, crafts and Chinese auction items. We will also have Santa from 6-8 pm. Pictures are $3. We have the Stryke 3 Band playing Christmas music for your enjoyment. Photos with Santa for people and pets. Kris’s Photography & Sweet Moon Baking PRESENTS: Pictures with Santa for People and Pets with Craft and Vendor Show. Mary Kay, Tastefully Simple, Celebrating Homes, AVON, Scentsy, The Leather Guy, Miche Bags, CPR Training, and more! 2PM-4PM Santa Arrives, Photos with Santa, Gift Bags for all Children, Cookie Decorating, Face Painting, “Tackie the Clown” Balloon Sculptures, Christmas Crafts, Carriage Rides. Tree Light-up with Music by the Monaca High School Band and Chorus. Come tell Santa what you’re wishing for! 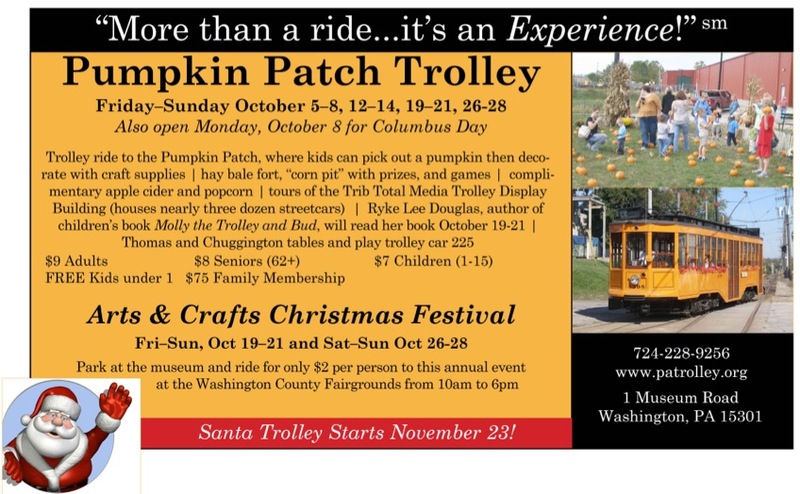 Then stay in Sewickley for Santa at Wolcott Park, free carriage rides and holiday music from 11:00am to 1:00pm. Stroll the streets and do some holiday shopping while you are here. Parking is free all day on Saturdays. Christmas Bazaar is a free event. Avoid the lines at the mall; support your local Volunteer Fire Department; and create a beautiful keepsake–all at the same time! We’ll have delicious breakfast & lunch foods to enjoy during your visit and yummy baked goods to take home! Have your child’s pictures taken with Santa by Lisa Crespo of Photography by Lisa C. Bring your camera and (weather permitting) have the kids’ pictures taken with a truck! Plenty of local businesses will be showcasing their services and goods. Prizes, drawings and lots of fun!!! Pictures are $15 for each child and that includes: a printed picture, a CD with the picture, a drawing ticket, and goodies for the kids!! 116 School Road Aliquippa, PA 15001 Independence Township. Fourteen trains of various sizes are operated on multiple tracks in a variety of settings. Refreshments are served and the Academy is open for tours. Visit the McCall Industrial Museum and visit Santa at the Log cabin on Dec. 10th. The Christmas Shoppe will be housed in the Center for Creative Arts Expression on the main street of Beaver Falls. Children meet Santa on the trolley while parents and grandparents enjoy caroling and the scenic ride. Visitors are also treated to the annual PTM Lionel toy train layout and the Yuletide Shuttle with our popular Mr. Conductor. Make a gingerbread house, coloring contests, meet Santa and more! Enjoy a very special evening combining the rich culture of the Harmony Society with a unique dining experience. Drinks and Hors d’ oeuvres will served in the Historic Granary. Then on to the Historic Feast Hall for a delicious dinner. Lanterns light the Hall and musical interludes punctuate the evening. Call 724-266-4500 ext. 101 for reservations. Girls Gone Shopping – A Craft and Vendor show for Autism Awareness event where all proceeds go towards Autism Speaks. Event will include a Chinese Auction and food will be sold. Some vendors and crafters include: Pampered Chef, Tastefully Simple, BeautiControl, Premier Designs, Avon, Designer Purses, Dove Chocolate Discoveries, Miche Bags, Thirty-One, Bel Monili, Apple City Scents, Mary Kay, Tupperware, Usborne Books, Willow House, Kara Vita, Silpada, All Occasion Gifts, Bow Wow, Cupcakes, Stella and Dot, Cooler Coasters, Erra Designs, Noah’s Ark Traveling Toy Workshop, Signature Home Styles, quilts, Christmas crafts, Steeler and Penguin apparel, artwork, wood work, and more! FREE Pancake and sausage breakfast for kids ages 8 and under! Bring your wish list! Join Erin Shriver, natural bodycare product designer, for a fun-filled workshop creating a custom holiday bath product. We’ll be whipping up gingerbread and candy cane-scented bath salts and packaging them so they are all ready for holiday gift-giving. Make Bird Feeders, Holiday Music, Story Telling, Refreshments, Open To All! Featuring Vanessa Campagna and special guest The Delaney’s. Please join Cochran Hose Company and Fern Hollow Nature Center for a fun morning with Santa. This free event features a chance to get your picture with Santa and talk to him about your Christmas list for this year, children crafts, treats, and a raffle with a grand prize of a fire truck ride for your family with Santa. Money raised from the raffle will be used for environmental programming at Fern Hollow Nature Center with the hopes of connecting all children, their families and the community to nature so they can play, learn and grow with nature in their everyday lives. Includes time with the REAL Santa & Mrs. Claus, a special gift, cookie buffet & more! Please join FHNC and the Italian Garden Project in a celebration of the Feast of the Seven Fishes. Learn about this Italian Christmas Eve tradition, sample some of the seasonal delicacies and participate in a hands-on demonstration as we prepare some of our favorites. All proceeds go to local food banks. Santa will arrive at 11am and pictures can be taken with Santa. Ornaments can be purchase for $5 (while they last). Join New Brighton Free Methodist Church for Holiday music at 2:00pm in Center Court. Join Western Beaver High School Choir on December 19 at 7pm in Center Court for a special Holiday performance! Join State Street Elementary School Choir for Holiday Music at Noon in Center Court. For details on Pittsburgh area mall Santas and mall events click the button below. All children who visit Santa receive a free gift. Click here to see a Santa Photo price list. By purchasing a Santa Fast Pass, you will be able to bypass the regular line and hop on to our faster VIP entrance line. Click here for more details! For details on each farms activities, please click below.